Bedwetting alarms emit a noise when moisture is detected. They will wake your child up, allowing him or her to go to the bathroom. Studies indicate a 60-80% long-term cure rate when bedwetting alarms are used correctly. 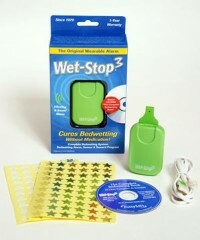 The Wet-Stop 3 has proven to be a safe and effective way to help stop bedwetting. The alarm attaches to the shoulder area of pajamas or tee shirt and contains the battery operated buzzer. The moisture sensor attaches to the child’s ordinary underwear or can be inserted into a disposable pant. Wet-Stop3 is convenient as well as effective. The Wet-Stop3 reacts immediately to the first few drops of moisture, teaching the child to stop the flow of urine before the bed becomes wet. During this learning process, dry underpants will be needed but the family will be spared the bother of remaking the entire bed. In less than six months, many children will no longer require use of the Wet-Stop3. Wet-Stop 3 Guarantee! If the alarm or sensor fails within a year of purchase due to a manufacturer’s defect, it may be returned to PottyMD for a replacement.